The days of using images to provide the visual effects are over. 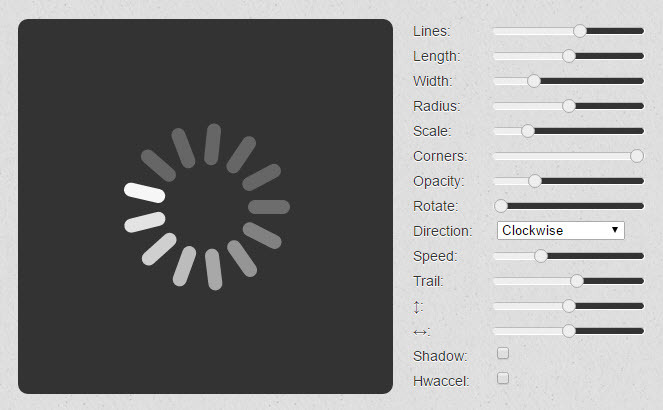 Now we can create gradients, shadows, rounded corners, use animations with styles only. And spinner image is not the exception. So if I need spinner for my project, I use spin.js by Felix Gnass usually. uses @keyframe animations, falling back to setTimeout(). The only thing I missed with this library was an overlay option – to cover the rest of the page and prevent a user from clicking any element while the required content is loading. You can find standalone example here or download the package.